The Upward Trend Blog: How Important Are Clean Restrooms In Your Business? 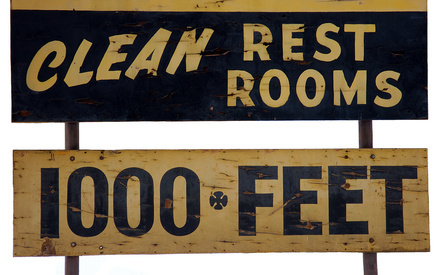 How Important Are Clean Restrooms In Your Business? I have to admit it. When I am travelling, I purposely stop at Starbucks for the bathroom. I almost always buy something to pay them back for the privilege, but I didn't go there for the Latte and Maple Scone (I do love their Maple Scones!). I go there for the consistency of their clean restrooms. I used to stop at McDonald's before I discovered Starbucks. McDonald's is okay, but not very consistent in comparison. If that's all there is for the next 20 miles, okay, but I prefer Starbucks hands down. In the last few years I have traveled by vehicle extensively. As a result of discovering Starbucks (I was a late bloomer. . .) about three years ago or so, I have had the opportunity to stop at quite a number of them. I have found their consistency of clean inviting restrooms is second to none in quantity and quality. I feel totally comfortable stopping there and while I'm stretching my legs, I might as well have a latte and a snack. I even have ended up looking at their music CD collections while waiting for the bathroom and have really enjoyed buying many of their CD's. They say at Starbucks that it is not the coffee, it is the experience. At first I didn't relate to that really well, but I get it. It is even more so when you relate it to stopping there as a first choice when coffee is the last thing on my mind. You just never know why someone is doing business with you. Now Starbucks knows the biggest reason I go there. I do love the coffee, the maple scones, the sandwiches, the cold drink selection, the CD's, the newspapers, the decor, the comfortable atmosphere, the friendly people, the service oriented team, the fun they seem to have working there, the locations, the colors and the fancy gadgets for sale, the comfortable chairs, and the restrooms. Awesome company and strategy. Sold me and I wasn't an easy sale.